Pesident Trump is doing wonders for the U.S. economy, and voters are taking notice. According to a recent CNN poll, 71 percent of Americans believe the economy is doing well — the highest level of positivity recorded by the survey since 2001. Likewise, a 51 percent majority of Americans also approve of President Trump’s handling of the economy, while only 42 percent of respondents disapprove. 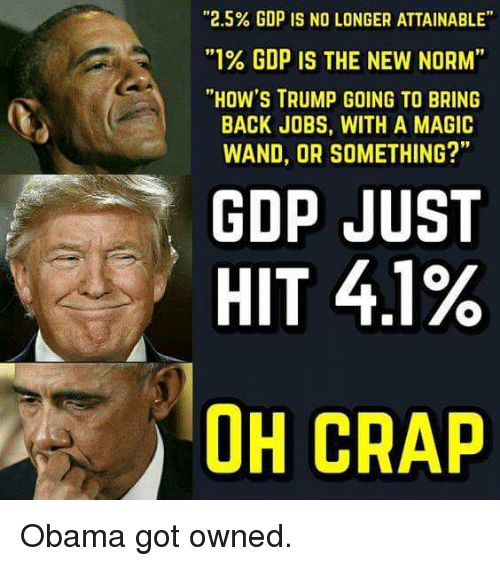 At the same point in Barack Obama’s presidency, on the other hand, only 16 percent of Americans thought the economy was in good shape, compared to 84 percent who rated it as “somewhat” or “very” poor. The economic confidence that Trump has inspired among voters isn’t a fluke, either. For more than two years, he has fought hard to repair America’s economic engine, implementing pro-growth policies to restore the prosperity lost from the Great Recession through Obama’s presidency. That approach has paid tremendous dividends, with nearly five million new jobs created in just over two years. Ten months after his inauguration, President Trump also succeeded in passing historic middle-class tax cuts — a move that boosted the economy even further. Meanwhile, his commitment to protecting American workers from unfair global competition by renegotiating harmful trade deals has created stability in the labor market and pushed the unemployment rate to the lowest level in decades. The good news doesn’t stop there, though. According to the most recent data from the U.S. Department of Agriculture, the total number of Americans on food stamps fell to 37 million people in December 2018, a decrease of nearly three million people since Trump took office. That’s the lowest number in nearly a decade, and a clear sign that the President is keeping his promise to raise struggling families out of poverty. The workers who no longer have to rely on the federal government for such basic necessities as food because they now have jobs that allow them to provide for their families know exactly who to thank for their newfound prosperity. Trump’s policies have sparked the greatest economic renaissance America has seen in decades, and no amount of political spin can conceal that fact from the millions of Americans who are better off today thanks to his efforts. @visafree, stick to the topic. The fake news is the Russian investigation news. As for obamacare the Trump administration is now taking it to the supreme court citing that a federal judge in texas has deemed Obamacare unconstitutional. When a federal judge declare a law unconstitutional the upper courts and supreme court will rule on that example. UNCONDITIONAL! so far, two courts have dash out his case from their court room, never before happened in history of this great country.. the dictatorship to take important legislation that million of lives depend on is just unamerican. @visafree said: " never before happened in history of this great country. " Obama passed Dream Act without congressional approval. Congress make laws President enforces the laws. With executive order obama overstepped his office constitutional mandated job states congress must legislate and pass law not the President. The Atlantic News: The law (Dream Act) has yet to pass Congress. But the directive issued by the Obama made it law. @visafree said:" so far, two courts have dash out his case from their court room "
That was then but now a federal judge passed judgement few months ago declaring obamacare unconstitutional meaning illegal. Trump job is to enforce those laws and what the Judiciary branch deem legal or illegal. And Trump has the constitution and judicial branch on his side. @visafree said: " the dictatorship to take important legislation that million of lives depend on is just unamerican"
Obamacare is unconstitutional according to the lower court. Unconstitutional laws not laws. Obamacare is illegal and unconstitutional just like slavery was abolished so shall Obamacare because its unjust and unconstitutional....Deal with it. lets face it, This is " Obama's law" called Obamacare aka Affordable Care Act, to kill and What Trump to replace with?>. NONE!! aka ZERO, aka NADA. this is about lives of millions of people and Trump want to take it away to according to trump, " to save some money". ? disgusting. Only retards and socialists would penalize citizens for being too poor to afford health care. mandate was repealed and from that let to ACA being ruled unconstitutional. No more socialist legacy. ACA is not unconstitutional , and the mandate is not to force poor people like some seems think , the reason for the mandate is to make sure people are cover not carry have burdens of medical treatment when becomes ill, you so, Obama cares", and those who cant afford health insurance can always apply for Medicaid programs that Trump is about to cut and get rid of..
@visafree, thats your opinion but according to a federal Judge in the USA Obamacare in its entirety IS=UNCONSTITUTIONAL. @visafree, the mandate was to force poor people to pay fines if they didn't apply for Obamacare. Another example of Obama overstepping the constitution. Obama forced poor people and he claimed he was for them. Only in socialists countries they do that. Like in Nazi Germany. Mandate means everyone must be covered during the whole year or else they have to psy the covers drung the tac season. Obamacare will be strike down. Since its been declared unconstitutional. Poor people are cover under the Medicaid programs, only those who are working can always pay for affordable cares, the whole idea is to make sure everyone is cover and no one citizen is taken advantage by the expensive heath insurance companies because Obama care about his citizens.. "Obamacare aka ACA.